Great martinis. Spinning salads. The best prime rib on earth. 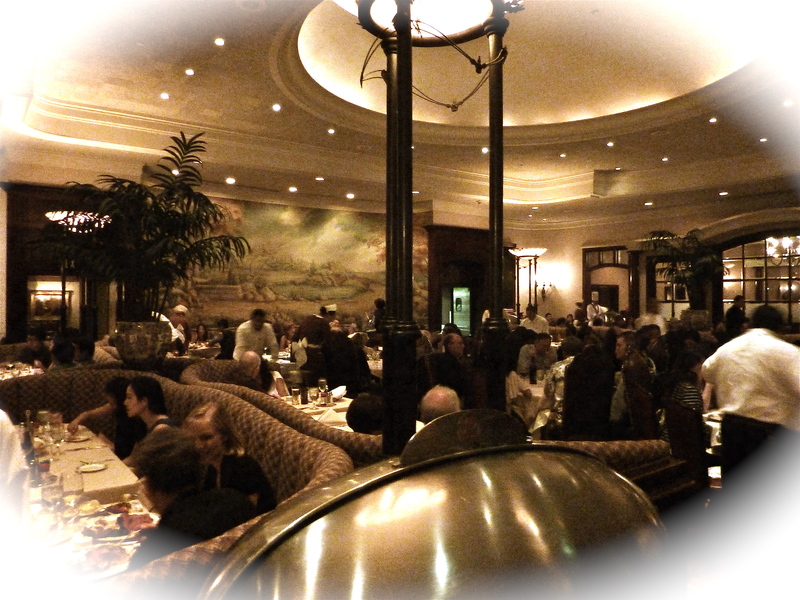 It’s right here at Lawry’s The Prime Rib in Beverly Hills. I have been coming here since I was a kid (the restaurant opened in 1938 and has been located during different stages on each side of La Cienega Blvd. 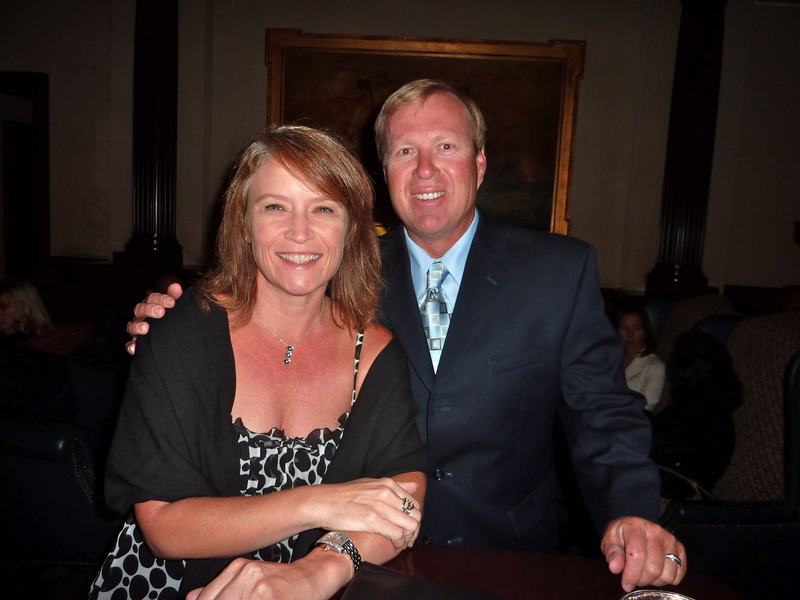 ), and when I found out that our friends Dan and Linda had never eaten at Lawry’s, Tracy and I told them we had to go. Plus, I had never seen Dan in a tie before!! Of course, I had to take a photo to show all our friends that Dan really owns a tie. 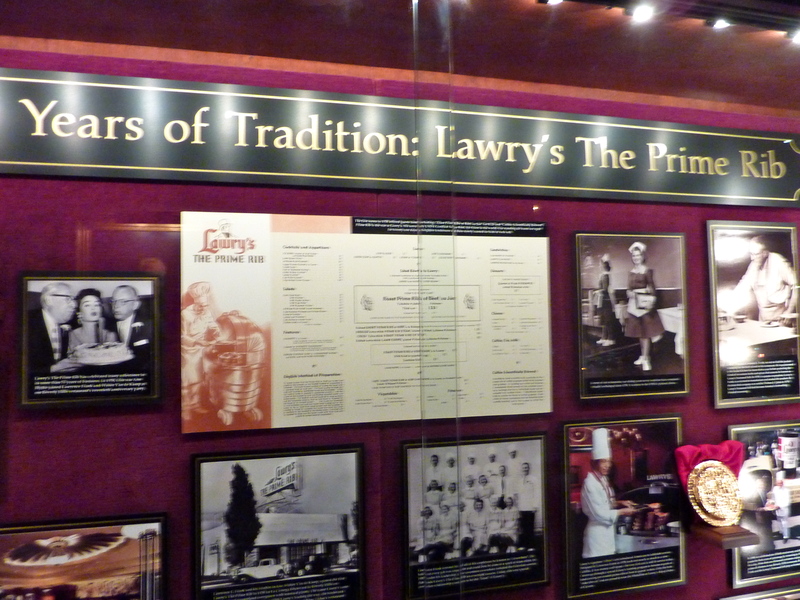 If you follow college football, then you have probably heard of Lawry’s. 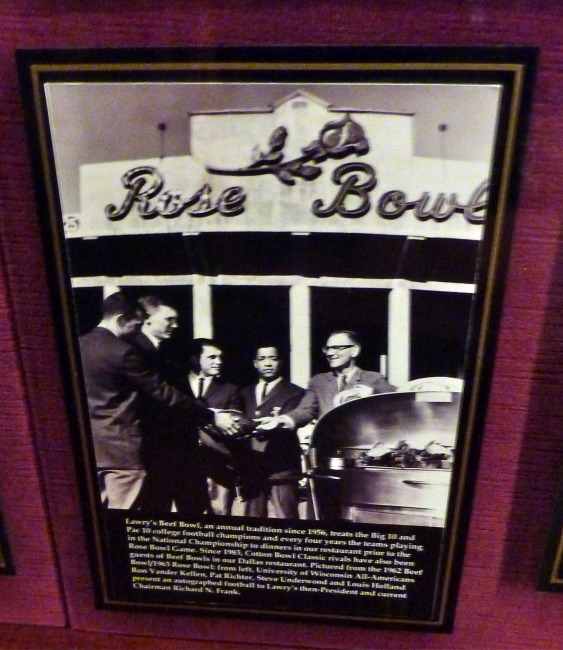 Before the 1957 Rose Bowl Game between the Oregon State Beavers and the Iowa Hawkeyes, Lawry’s invited the the two competing teams to chow down a few nights before kickoff. 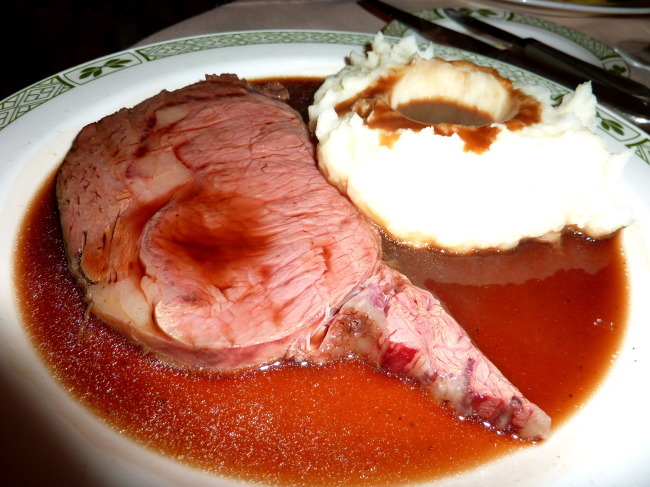 Thus began an annual tradition of hosting both Rose Bowl-bound teams for humongous portions of delicious prime rib. In the early 1960s the event was dubbed the Lawry’s Beef Bowl. According to Lawry’s, more than 75,400 pounds of roasted prime rib have been enjoyed by Rose Bowl bound players and coaches in the past 54 years. We met Dan and Linda in the beautiful bar area of the restaurant before dinner. I had requested a booth in the main area of the restaurant that has the most historical significance to me since this is the area we always dined at when I was a kid. After a few sips of our martinis, the four of us were seated at a corner booth in that main dining area that afforded us a panoramic view of this great room. 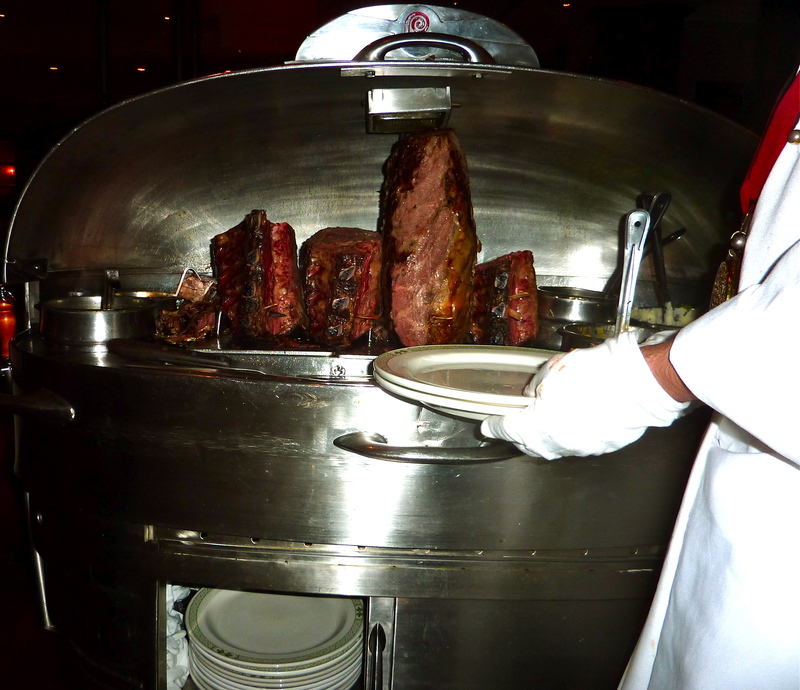 Our great waiter (well, we didn’t know that at the time) introduced himself and said the only thing we had to figure out was whether we wanted prime rib and what sides we wanted, because the famous Prime Rib Cart would be coming up later. Everyone ordered Prime Rib (medium rare), except Linda who opted for a piece of Fresh Salmon ($32) and Fresh Asparagus with Hollandaise Sauce ($8). 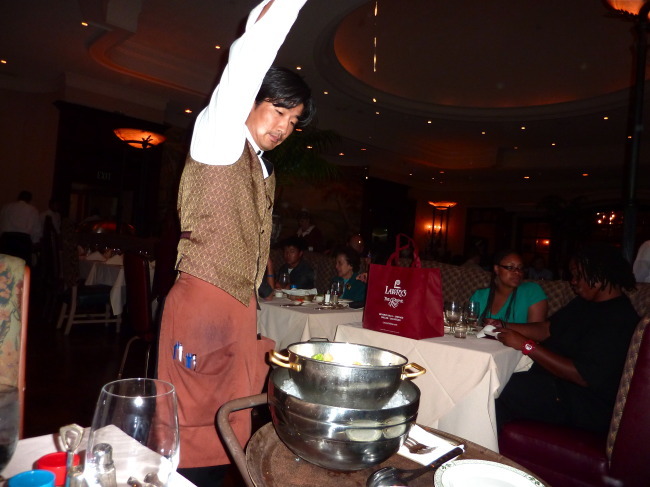 Then came the first of Lawry’s great traditions, the spinning salad bowl. The salad was prepared table-side by our server who spins a large metal bowl of greens (above) on top of a bed of ice while pouring from great heights Lawry’s secret dressing. They’ve been doing it this way since 1938, and although this bit of restaurant theater has been imitated by other restaurants, in my opinion it has never been duplicated or topped. 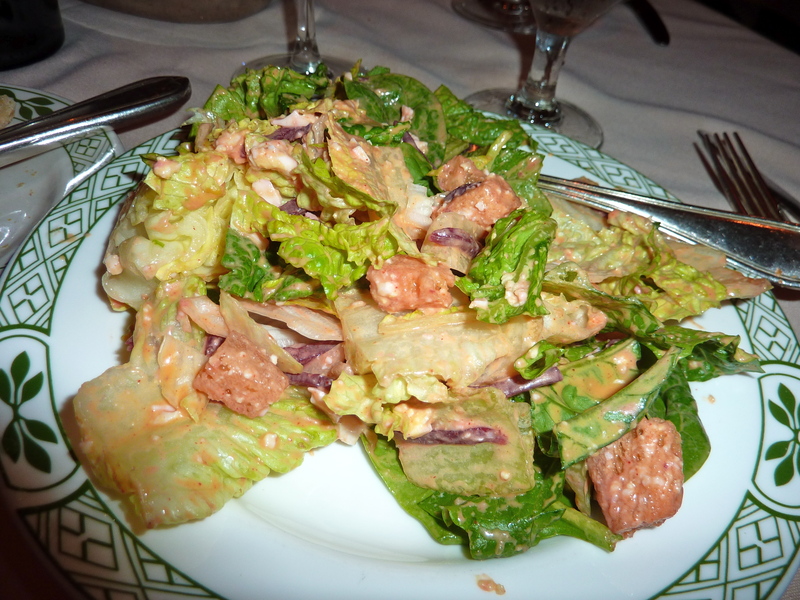 The salad of Crisp Romaine and Iceberg Lettuce, Baby Spinach, Shredded Beets, Chopped Eggs and Croutons, tossed in Lawry’s exclusive Vintage Dressing is included in the meal price. The cold salad forks are a nice touch, too. After finishing our salad, another Lawry’s tradition was standing next to our table. Throughout the evening, large silver carts meander the rows of tables, and it was now stationed next to us. Our server asked us how we would like our prime rib, and the carver then goes to work on a piece of prime rib the size of Texas. Dan and I got the Lawry’s Cut , the traditional and most popular cut ($39), while Tracy ordered the California Cut, a smaller cut (but still plenty) for $34. Both the creamed spinach, seasoned with spices, bacon and onion, and creamed corn ($6) are terrific. Included in the price are the Mashed Potatoes (when I was a kid they used to give me three large scoops) and their famous Yorkshire Pudding. This carnal, carnivorous feast has never left me unsatisfied, and tonight’s gorging frenzy was no different. Fortunately I stopped just short of popping buttons from my pants and shirt, and amazingly still had room for dessert. 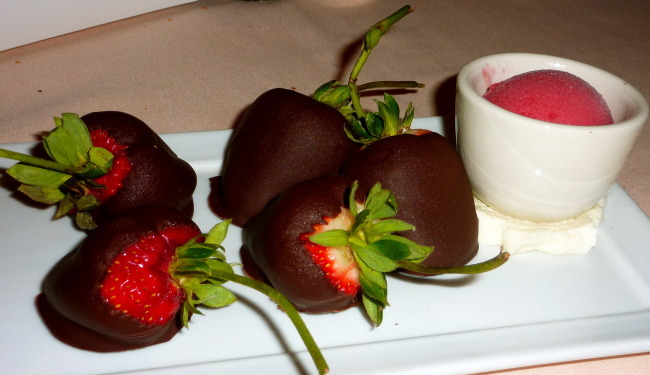 I just happen to love Lawry’s strawberries ($8), giant strawberries that look they have been spawned by a nuclear disaster covered in dark chocolate and served with a refreshing raspberry sorbet. I loosened my belt by a couple of notches, let out a sigh of contentment and enjoyed my after-dinner cappuccino. Lawry’s is not cheap, but sometimes you have to splurge, and since we are Lawry’s Dining Club members, we always have coupons to make it more affordable. 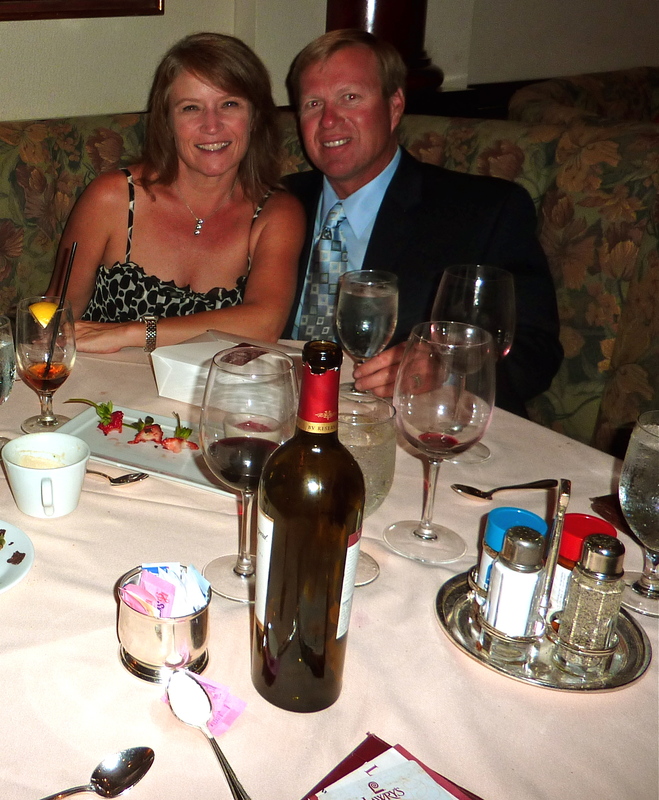 They send you coupons for birthdays, anniversaries and for amounts spent at any Lawry’s restaurants, so the bill never hurts. I will admit that I am biased, so the entire Lawry’s The Prime Rib experience rates 4.75 Maitais in my book. I love this place!!! 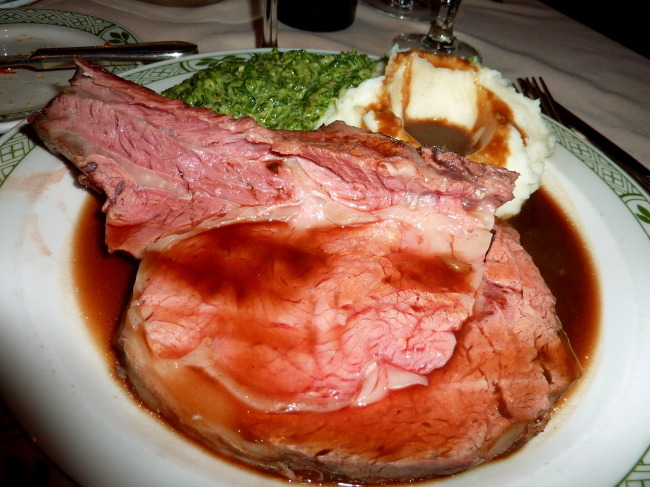 For a special event, an elegant evening out or an opportunity to see your buddy all dressed up, my favorite “go to” spot in Los Angeles is Lawry’s The Prime Rib. Dinner: Monday – Friday: 5:00 p.m. – 10:00 p.m.
Dinner: Saturday: 4:30 p.m., – 11:00 p.m.
Dinner: Sunday: 4:00 p.m. – 9:30 p.m.